Timetables and ticket booking for ferry crossings from Amalfi to Ischia. Includes prices, journey times and other useful information. You can purchase tickets for crossings between Ischia and Amalfi along with other destinations along the Amalfi Coast via our ticket booking engine below. Please note, the booking engine is managed by a partner company called Traghettilines/OK Ferry who handle all aspects of the booking process including sales and customer service. The booking fees applied are not levied by Ischia Review but by the partner company. You can buy tickets directly from the ticket offices at the ports where no booking fees apply but we offer the booking engine as a facility to those of our site-visitors that wish to purchase on-line. From Saturday 16th June 2018 until Saturday 15th September 2018 there are daily crossings from Amalfi to Ischia. The service provided by Alilauro leaves every morning at 8:25am and arrives in Ischia Porto at 10:45, two hours and twenty minutes later. There's also an afternoon departure with Alilauro from Amalfi to Capri which leaves Amalfi at 15:00 and arrives in Capri at 16:20. You can use this service to then connect with the 16:40 hydrofoil from Capri to Ischia but please note, you have to buy two separate tickets - one for the journey from Amalfi to Capri and one for the journey from Capri to Ischia as they are often different boats. Every piece of heavy luggage such as a suitcase costs €2. Tickets can be bought directly from the ticket offices at the port in Amalfi. Between the beginning of May and the end of October there are thrice weekly crossings from Amalfi to Ischia in the afternoons. These are day trips from Ischia run by Ischia Cruises. The sailings take place on Tuesdays, Thursdays and Sundays. Having sailed to Positano from Ischia the boats then make their way to Amalfi where the day-trippers spend a couple of hours looking around the town. The boats leave Amalfi Port at 16:00 (from 1st May to 30th September) or 15:45 (during October) and at this stage anybody wishing to visit Ischia can board the boats for the return journey at a price of €20. Arrival time in Ischia is between 17:30 and 18:30 depending on which of the three ports you intend to sail to. Ischia Porto is the first stop and is then followed by Lacco Ameno and Forio. NEED A HOTEL IN AMALFI? 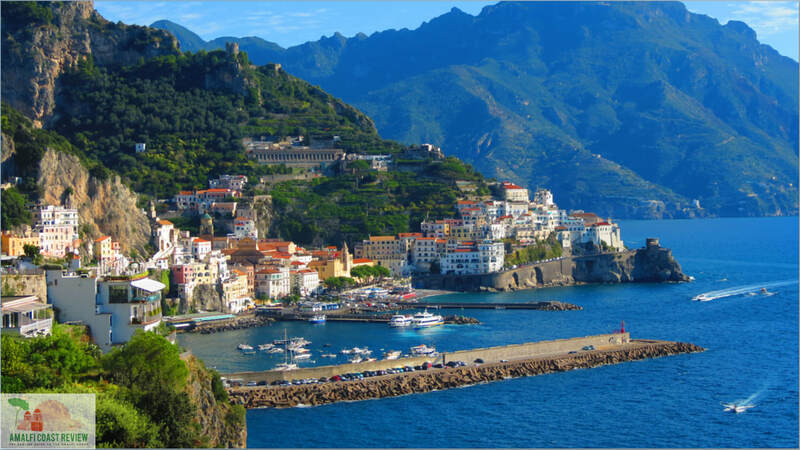 Click the green button below for a full list of hotels in Amalfi. You can read genuine reviews, check prices & availability or make a booking.